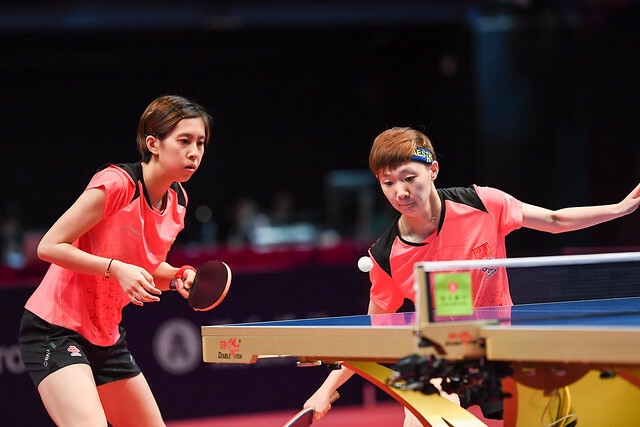 Qualification for the Seamaster 2018 ITTF World Tour Hang Seng Hong Kong Open officially got underway on Tuesday 22nd May and you can relive what was a day of stunning developments with our review. Requiring the full seven games distance, Hong Kong’s Jiang Tianyi experienced a nervous opening to the Men’s Singles qualification event as Swedish competitor Hampus Soderlund gave a very good account of himself (11-4, 12-14, 11-7, 2-11, 11-4, 7-11, 12-10). One of the big upsets of the round came courtesy of Joe Seyfried with the French representative accounting for India’s Sanil Shetty across six games (11-6, 14-12, 7-11, 9-11, 11-6, 11-9). There was very nearly another upset win for France as Alexandre Cassin fell to Portuguese opponent Joao Monteiro by the narrowest of margins (9-11, 11-4, 11-7, 7-11, 11-0, 11-13, 12-10). Against expectations, Japan’s Yuki Hirano, youngest brother of Sayaka Hirano, prevailed in his encounter with Kenji Matsudaira (11-1, 11-7, 11-8, 11-4) and young Indian star Manav Vikash Thakkar proved successful over Yang Heng-Wei (11-9, 11-6, 11-7, 11-7) despite sitting 600 positions below the Chinese Taipei player in the World Rankings table. Sakura Mori has crashed out of the Women’s Singles qualification rounds at the first attempt: leading by two games to one the Japanese competitor, who was placed at the top of the draw, lost the next three games in a row as Hong Kong’s Lam Yee Lok progressed (5-11, 11-7, 10-12, 11-8, 11-9, 11-6). On a day of mixed emotions for the local favourites it was two all-Hong Kong duels which took the spotlight with unexpected early exits for Soo Wai Yam Minnie and Ng Wing Nam, who suffered defeats at the hands of Mak Tze Wing (11-8, 11-8, 11-8, 11-3) and Li Ching Wan (11-3, 9-11, 5-11, 11-9, 11-7, 7-11, 11-9) respectively. Two athletes will represent Russia in the second round of qualifying action, one of whom is Yana Noskova following her sensational display against China’s Mu Zi (8-11, 11-6, 11-9, 12-10, 5-11, 11-9) while Chinese Taipei’s Cheng Hsien-Tzu was left stunned by Yang Xiaoxin of Monaco (11-8, 11-8, 9-11, 8-11, 11-9, 8-11, 11-7). Over in the Women’s Doubles qualifiers there was a major surprise from the Hong Kong duo of Li Ching Wan and Liu Qi as they recovered from two games down to beat Poland’s Li Qian and Kinga Stefanska in five games (6-11, 10-12, 11-4, 11-6, 11-8). Similarly, in the Men’s Doubles event there was a mini-comeback from the Ukraine’s Kou Lei and Belgium’s Cedric Nuytinck, who defeated the Austrian partnership of Chen Alexander and Narayan Kapolnek (11-9, 9-11, 8-11, 11-9, 11-6).